And to the ballpark he went. In 1938 Bill Rigney signed with the Oakland Oaks of the Pacific Coast League and was farmed out to the Spokane Hawks in the Class B Western International League. In 16 games he batted only .083 but was nonetheless bought up to Oakland, where he hit .265 in 24 games. Rigney was still in the game more than six decades later, back in Oakland with the A’s in an executive capacity. He was still with the A’s when he died in 2001. Rigney was born in Alameda, California, on January 29, 1918, the second of four children born to George and Eleanor Rigney. His father was in the tile business and eventually owned a tile-distribution company. Growing up, Bill watched his father and uncles play semipro ball for the Rigney Tile Company and rooted for the New York Giants. When he came to the majors it was with the Giants and he continued in the Giants organization as a player, minor-league manager, and major-league manager for 15 seasons. He was the team’s manager when the New York Giants became the San Francisco Giants in 1958. In 1939 Rigney played for the Vancouver Capilanos and the Bellingham (Washington) Chinooks in the Western International League. At Bellingham he was stricken by appendicitis and his season ended after 60 games in which he hit .270. In 1940 he batted .276 for the Topeka Owls of the Class C Western Association. He returned to Oakland in 1941 and spent two years with the Pacific Coast League Oaks. At the time, the closest major-league team was in St. Louis, 2,000 miles away. Most teams in the PCL operated independently and many former major leaguers populated the rosters. Young Rigney availed himself of the opportunity to learn from these older players. Although he hit only .208 in 1941, Rigney’s numbers for 1942 opened some eyes. He played in 177 games and batted.288. Then World War II intervened. On October 10, 1942, Rigney enlisted in the US Navy, and spent the next three years in the service. He was first stationed in pre-flight at St. Mary’s College in Moraga, California, where he met Paula Bruen, a secretary at St. Mary’s. They married in 1944, and were together for 54 years, until Paula died in 1998. They had three children. Bill Jr. (1945-2013) followed his father into baseball and was named Double-A Executive of the Year by The Sporting News in 1979 when he was with the Midland Cubs of the Texas League. Bill Sr.’s other children were Tom Rigney (born 1947) and Lynn Rigney Schott (1949). Bill and Paula had six grandchildren. In 1944 Rigney was at the Alameda (California) Naval Air Station preparing to be sent to the Mariana Islands when his commodore, very much the baseball fan, found another position for him. He spent 1945 playing the infield for his unit’s baseball team. While Rigney was in the Navy, the New York Giants in 1943 purchased his contract from Oakland in exchange for Dolph Camilli (who was to be the Oaks’ player-manager). He was discharged on November 12, 1945, and signed an $8,500 contract for 1946. When he arrived in New York after spring training in Arizona, it was for the very first time. Like many ballplayers of his and prior eras, he played in the first major-league game he saw. It took place on April 16, Opening Day, against the Philadelphia Phillies at the Polo Grounds. The 28-year-old Rigney played shortstop and led off. In 1998 he told writer George Will he had hoped that “If there’s a God in heaven, let someone quickly hit a ball to me and get it over with.”3 His first fielding chance came when Skeeter Newsome slammed a grounder in his direction. He made the play and thought, “I may be all right up here.”4 He struck out on an Oscar Judd 3-and-2 screwball in his first at-bat. Two batters later, Mel Ott put the Giants in the lead with a two-run homer. It was the 511th and last home run of Ott’s career. Rigney had two hits and scored a run in the 8-4 Giants win. Rigney’s Giants were not faring well on the playing field. In his rookie season the team (61-93) finished last in the National League. The team had been seriously damaged by the raids of the Mexican League, losing nine players, including pitcher Sal Maglie.7 After acquiring several sluggers in the offseason, the team rebounded for a fourth-place finish in 1947, but had virtually no pitching to complement the offense that produced 221 homers. They also displayed little speed, stealing only 29 bases. The Giants were treading water in 1948 when the likeable Mel Ott was replaced by Leo Durocher 76 games into the season. Rigney played well enough to be selected for the All-Star Game. For the year, he batted .264 with 10 homers and 43 RBIs. His home-run count was down as Durocher encouraged him to hit the ball to all fields and stop trying to pull it over the short porch in left field.8 Under Durocher, the team went 41-38 to finish out the 1948 season, but the new manager was looking to shake things up. A year later, Rigney would not be the only one. 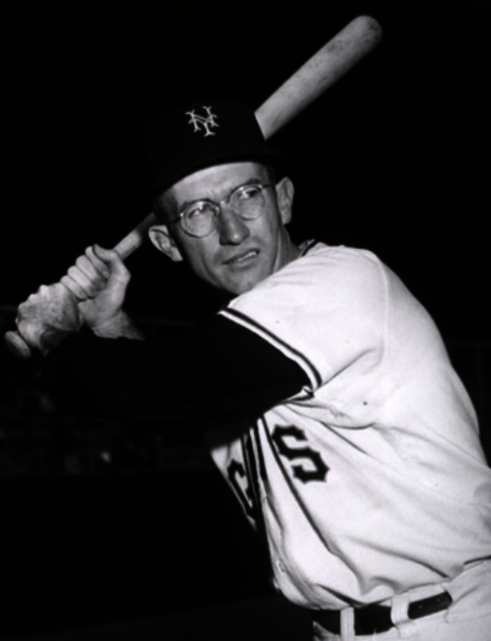 The 1950 Giants underwent a series of changes that propelled them to third place and put Rigney on the bench. Al Dark and Eddie Stanky were acquired from the Boston Braves for shortstop and second base. Henry Thompson played third base. Rigney came to bat only 83 times and batted .181. On August 9, 1951, after the Dodgers had swept a three-game series from the Giants to take a commanding 12½-game lead, Jackie Robinson came into the Giants’ clubhouse and said to Durocher, “Leo, Leo, how do you like it? I can smell Laraine’s perfume all the way in here (the visitors’ clubhouse).” He was referring to actress Laraine Day, who was Durocher’s wife. The Giants could hear Dodger pitcher Ralph Branca singing, “Roll out the barrel, the Giants are on the run. The Giants are done.”12 Rigney would not forget these comments. Rigney spent most of 1951 on the bench, batting .232 in 69 at-bats. But between June 22 and July 15, he started 13 games, and had 12 hits in 48 at-bats. The Giants won eight of the games. In the climactic third game of the playoff with the Dodgers, Rigney pinch-hit for catcher Wes Westrum with the Giants trailing 4-1 in the bottom of the eighth. Teammate Eddie Stanky had told him that Dodgers pitcher Don Newcombe was tiring, but Rigney stuck out and the next two batters were retired as well. Rigney pinch-hit for Hank Thompson in Game Two of the World Series against the Yankees with one out in the top of the seventh, the bases loaded, and the Giants trailing Yankees southpaw Eddie Lopat, 2-0. Urged by Durocher not to hit into a double play, 17 Rigney hit a fly ball to right that was corralled by Hank Bauer on the warning track. Monte Irvin scored from third, and it was the Giants’ only score as the Yankees won, 3-1. Rigney batted foiur times, each time as a pinch-hitter. His only hit came in Game Six when he singled in the seventh inning, but was left stranded as the Yanks won 4-3, to win the Series. During the next two seasons Rigney again spent most of his time on the bench, being more observer than participant and grooming himself for the next stage of his career. He batted .300 in 1952 in 90 at-bats. The following season, he saw even less action, coming to the plate only 20 times and having five hits to show for his efforts. That was the end of Rigney’s major-league playing career. In eight years, he had batted .259 with 41 homers and 212 RBIs. Rigney’s success in Minneapolis, coupled with the widely held belief that Leo Durocher was through, fed rumors that Rigney would succeed Durocher. Then owner Horace Stoneham called, offered him the job, and Rigney took it. He managed the Giants during their last two years at the Polo Grounds. The team he inherited was aging and its 67 victories in 1956 were the lowest since 1946, Rigney’s rookie year. Rigney was different from his predecessor in many ways, particularly in his relationship with the team’s star, Willie Mays. James Hirsch, in his biography of Mays, wrote, “Rigney wanted to establish his own authority, to create a different culture (from Durocher), so he vowed to treat all players the same.” Rigney even went so far as to say “If anyone can show me enough to move out Willie, Alvin (Dark), or Don (Mueller), even those spots may not be safe.”20 This approach did not sit well with Mays, and when Rigney criticized him publicly, not privately as Durocher had, a rift formed between the two. In the Giants’ last home game at the Polo Grounds, on September 29, 1957, Rigney started as many members of the Giants’ 1954 championship team as he could field, seven in all. Most of them would not be prominent after 1957, but Bill Rigney was going home to the Bay Area. As manager of the New San Francisco Giants, Rigney had several new faces that had spent the prior season on the farm. Orlando Cepeda, Jim Davenport, Willie Kirkland, and Bob Schmidt joined the Giants and brought San Francisco into pennant contention during their first two years in Seals Stadium. In 1959 the team led the league by 3½ games in late August, but dropped 18 of their last 29 games to finish in third place, three games behind the Dodgers. That collapse put Rigney’s job in jeopardy. In June 1960 the Giants were in second place with a 33-25 record, four games behind the league-leading Pirates. However, they had lost eight of 12 games, including three straight at home to the Pirates, and Horace Stoneham, who held Rigney responsible for the prior year’s collapse, fired his manager. For the balance of the season, Rigney and everyone else could only look on in dismay as the Giants, under interim manager Tom Sheehan, finished at 79-75, slipping to fifth place, 16 games behind the Pirates. The expansion cast of misfits and castoffs did have fun, and Rigney, sometimes unwittingly, joined in. Veteran pitcher Art Fowler once tried to sneak up and give Rigney a hot foot at a team meeting. Rigney caught him, spit on Fowler and said, “The meeting’s over.”24 Rigney was prone to ulcers during this time and clubhouse man Tommy Ferguson would prepare pound cake and milk for the skipper. The treat, however, did not always get to the skipper. One time Earl Averill took a couple of bites from the cake and sipped some milk. Those on the bench broke into laughter. Rigney’s times with the Angels were good years. In 1962 the team almost did the impossible. The Angels got off to a good start and had great team spirit. Playing the Yankees in New York on May 22, the Angels had won four straight to pull within two games of the league-leading Bronx Bombers. Through nine innings the teams were tied, 1-1. Rigney had his pitchers (he used four in all) issue seven intentional walks including an American League-record four to Roger Maris, before Elston Howard’s sacrifice fly drove in Joe Pepitone with the game-winner in the 12th inning. The Angels took their record to an astounding 18 games above .500 (82-64) on September 11 to sit in second place, four games behind the Yanks. That was as close as they would get, slipping to third in the late going. Nevertheless, the upstart Angels held everyone’s interest for the bulk of the season and Rigney garnered the American League Manager of the Year Award. Rigney was fired 39 games into the 1969 season. The team had lost ten straight games and was in last place with an 11-28 record. His overall record with the Angels was 625-707. After the 1962 season, the team under his leadership never again reached those heights. Late in the 1969 season, Rigney returned to the Giants, this time helping out with their radio broadcasts, joining announcers Russ Hodges and Lon Simmons. But his stay in the announcing booth was temporary, as he was anxious to manage again. Rigney returned to the Twin Cities in 1970 and guided the Twins to their second consecutive Western Division championship. They lost in the League Championship Series to Baltimore, and would not return to the postseason for 17 years. The 1970 Twins had a potent lineup with Harmon Killebrew, Tony Oliva, and Cesar Tovar leading the way. The pitching staff was headed by Jim Perry who went 24-12 en route to the Cy Young Award, and Ron Perranoski who had a league-leading 34 saves. However, the team had a number of key injuries along the way. Pitcher Luis Tiant spent two months on the disabled list, and Rod Carew’s broken leg put him and his .376 batting average on the shelf on June 22. He didn’t return for three months.26 Rigney spent two more years with the Twins before he was fired midway through the 1972 season. In his early years in Oakland with its new ownership, Rigney was very much involved with the decision-making process, and nary an important decision was made without his input. During his tenure which, on occasion, took him to the broadcast booth, manager Tony LaRussa and general manager Sandy Alderson relied on him for knowledge and advice. Rigney was with the A’s for 20 years, and was still with them when he died from cancer on February 20, 2001. He was 83 years old. Bitker, Steve, The Original San Francisco Giants: The Giants of ’58 (Champaign, Illinois: Sports Publishing Inc., 2001). Graham, Frank, The New York Giants (New York: G.P. Putnam’s Sons, 1952). Hensler, Paul, The American League in Transition, 1965-1975 (Jefferson, North Carolina: McFarland and Company, 2013). Hirsch, James, Willie Mays, The Life, The Legend (New York: Scribner, 2010). Hynd, Noel, The Giants of the Polo Grounds: The Glorious Times of Baseball’s New York Giants (New York: Doubleday, 1988). Peary, Danny, We Played the Game: 65 Players Remember Baseball’s Greatest Era – 1947-1964 (New York: Hyperion, 1994). Prager, Joshua, The Echoing Green: The Untold Story of Bobby Thomson, Ralph Branca, and the Shot Heard Round the World (New York: Random House, 2006). Vincent, Fay, ed., We Would Have Played for Nothing: Baseball Stars of the 1950’s and 1960’s Talk About the Game They Loved. (New York: Simon and Schuster, 2008). Will, George, Bunts: Curt Flood, Camden Yards, Pete Rose, and other Reflections on Baseball (New York: Scribner, 1998). Will, George, Men at Work: The Craft of Baseball (New York: Macmillan, 1990). Bush, Dave, and Dwight Chapin, “It Musta Been Rigged: Bill Rigney, Dead at 83, Lived a Charmed Life in Baseball,” San Francisco Chronicle, February 21, 2001. Creamer, Robert, “Leo Durocher is No Longer Manager of the Giants,” Sports Illustrated, October 3, 1955. Dyer, Braven, “Rigney Haunted by Memory of Record in Close Games,” The Sporting News, January 27, 1962. Dyer, Braven, “Chesty Cherbus Spreading Wings for Fast A.L. Flight,” The Sporting News, June 2, 1962. Robinson, Murray, “Rigney Charges Umps Give Outs with Fielder Off Bag,” New York Journal-American, August 6, 1957. Ward, Alan, “Oak Notes from Visalia,” Oakland Tribune, March 10, 1939, 34. Interview with Tom Rigney (Bill Rigney’s younger son). January 3, 2014. Interview with Earl Averill. January 9, 2014. 1 Bill Rigney, quoted in Fay Vincent, ed., We Would Have Played for Nothing, 37. 2 Alan Ward, Oakland Tribune, March 10, 1939. 3 George Will, Bunts, 236-238. 5 Steve Bitker, The Original San Francisco Giants: The Giants of ’58, ’62. 6 Danny Peary, We Played the Game, 27. 7 Noel Hynd, The Giants of the Polo Grounds: The Glorious Times of Baseball’s New York Giants, 336-337. 14 James Hirsch, Willie Mays, The Life, The Legend, 129. 15 Joshua Prager, The Echoing Green, 209. 19 Robert Creamer, Sports Illustrated, October 3, 1955. 22 Murray Robinson, “Rigney Charges Umps Give Outs with Fielder Off Bag,” New York Journal-American, August 6, 1957, 7. 23 Dyer, The Sporting News, January 27, 1962. 25 Dyer, July 14, 1962. 26 Paul Hensler, The American League in Transition, 1965-1975, 78-81.